Clicking this image will take you to an external page. These signs are indications, and don’t each individually mean that someone is being trafficked. 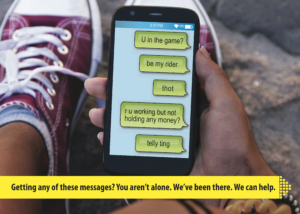 If you read through and see a lot of signs, or are concerned that you or someone you know is being trafficked in Canada – check out East Metro Youth Services for more information and support. Reaching out for help could break the isolation.